Stagecoach festival has announced the lineup for its 2019 edition which takes place April 26-28 at the Empire Polo Field in Indio California (aka same place as Coachella. The 2019 performers include headliners Luke Bryan, Sam Hunt and Jason Aldean, plus Ashley Monroe, Becca Mancari, Brett Michaels, Dawn Landes, King Leg, Lynrd Skynyrd, Parker Millsap, Ruby Boots, Tom Jones, and more. Guy Fieri will have a Stagecoach Smokehouse, and Nikki Lane has a “Stage Stop Marketplace.” Finally, Skynyrd, Tom Jones and Guy Fieri all in one place. 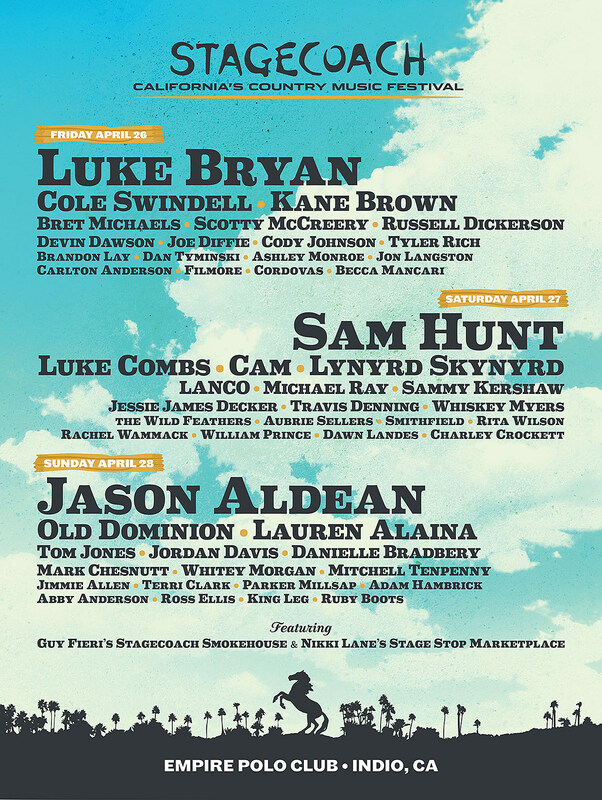 Tickets for Stagecoach go on sale Friday, Oct. 19 at 11 AM Pacific. Check out pics from Stagecoach 2018. Meanwhile, no word on who is playing Coachella 2019, which will happen the weekends before Stagecoach, but there have been some rumors.